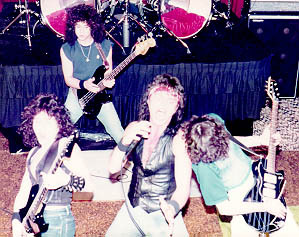 Some of the first photos of Queensryche or rather The Mob as they were called in 1981 when these were taken. first person from Europe writing to them I got personally written letters back from the band. This was even before they got the record contract with EMI. 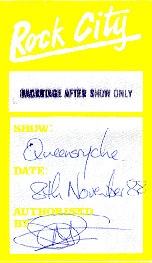 The first time I met Queensryche, after having corresponded by letters for almost a year. 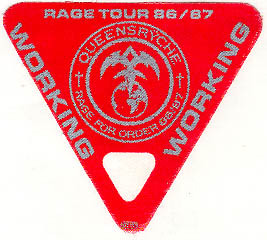 From this point on and up until 1990 I ran the Queensryche swedish fan-club. 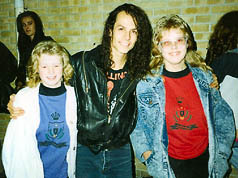 Here I presented them with the first Queensryche Swedish Fan Club t-shirt. 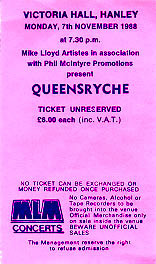 During 1985 Queensryche played a lot of shows in the US both supporting and headlining. 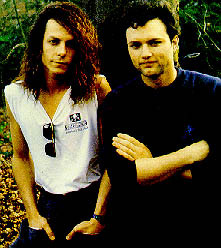 Geoff Tate was also approached by Ronnie James Dio to sing on the Hear n' Aid project, Stars. 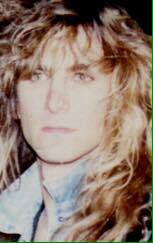 Geoff was of course one of the two best singers on the project together with Paul Shortino. Also on the project was Ted Nugent and Spinal Tap. 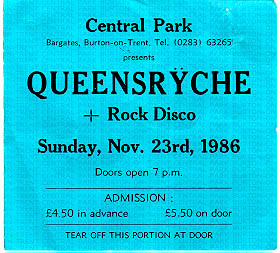 This show in Burton was meant to be Queensryche's first headlining show in Europe. But because of problems with their first management, the show was sadly cancelled. 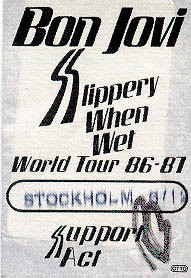 They still went on a European tour as special guest to Bon Jovi. 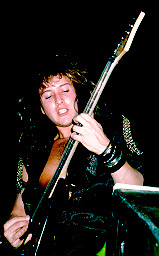 Rudolph Schenker from Scorpions. But they weren´t the only people that came to this show. who sadly never got off the ground, at least I never heard anything from them. 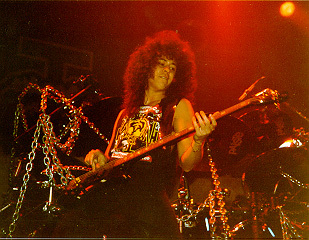 Scott asked me what song was my favorite Thin Lizzy song and when I said "Ballad Of A Hard Man"
he was sincerely happy. That was the only Thin Lizzy song that was written just by Scott. were playing in Switzerland and I hadn't seen them in 3 days (!!) and called him back and cancelled the snooker game. got confused and asked if there was a Festhalle in Lausanne and there were and went on to the wrong city. the show from the side of the stage. You should have seen the surprised looks on especially Chris and Geoff's faces. 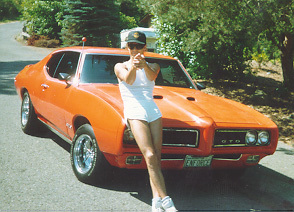 and last but certainly not least, to meet Queensryche for one week at home in Seattle, or rather the suburb of Bellevue. writing and rehearsing some new songs in Scott's basement, none of which ended up on Operation. 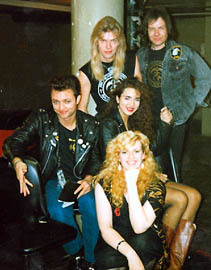 When Queensryche was in Holland with Peter Collins to mix the tracks for Operation I went down to visit. Actually when I got there, the first mix was just done, Anarchy X/Revolution Calling. 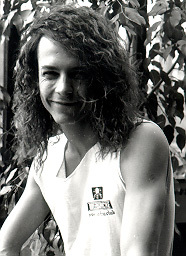 The fun thing was that Chris had taken with him the Queensryche swedish fan-club t-shirt I gave him in 1984. 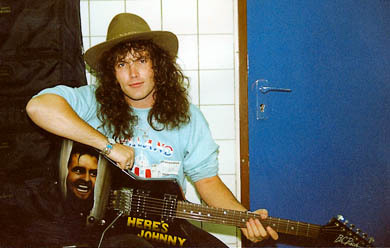 It was still one of his favorite t-shirts and it ended up on the pictures in a Metal Hammer article as well. at the studio he suggested that we should capture this on photo. cousins, Madelene and Lena. Another friend of mine, Marie Gustavsson, is in the background. Scott in the Eiffel tower, the whole band and I had a day off in Paris. Eddie practising in Paris, while Lars Ulrich was soundchecking. My favorite song of ALL TIME, played LIVE for the first time, as a warm-up for the headlining dates in England. 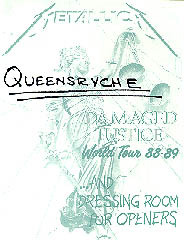 Michael was wearing the other edition of the Queensryche Swedish Fan Club T-shirt. Scotts drumkit was added with chains on this tour, not tubes as on the Rage Tour. 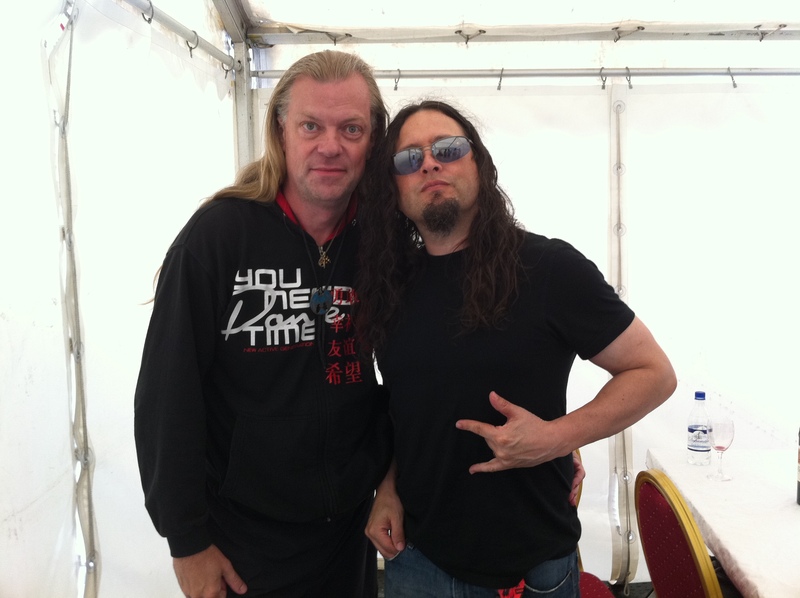 on timer as I am the one with the Queensryche Swedish Fan Club t-shirt behind Geoff. Also on the photo are Karen Lloyd, Marguerite Merola and Robin Edmondson. thankful because he hadn´t heard of it and he thanked me again when he saw me at this show. and started thinking that inside there was one of my old idols, Gregg Giuffria, from Angel. on his way to get some beer, they had just finished their set and they had been great. James Christian that surprised me with being crystal clear and "almost" as good as Geoff. 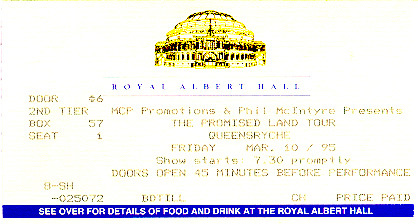 I sat in House of Lords dressingroom and forgot about Queensryche until I heard NM 156. 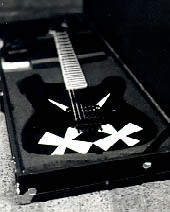 The back of the guitar had "Red Rum" painted. his comeback he still drove like a maniac, while crossing the parking lot to the arena. 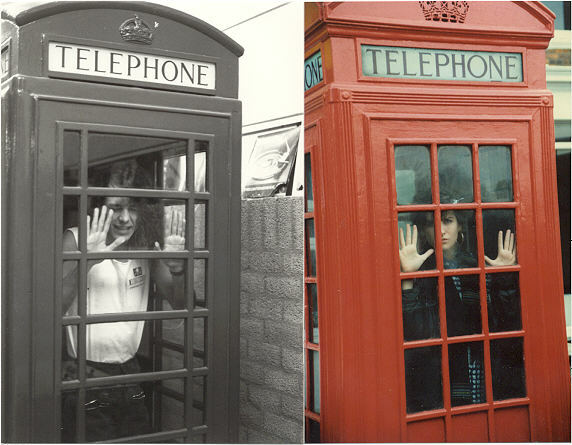 "For the first time in this beautiful place"
"We´ve got Scott caged in for this tour. He´s so loud"
At this release party none of the members were attending. 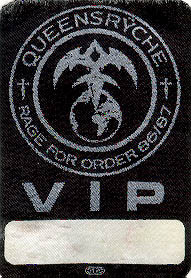 It was still fun to meet a lot of old Queenryche fans and friends. 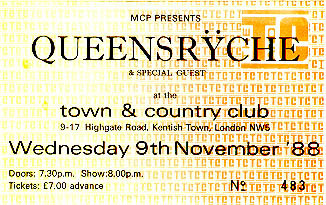 In spite of rumors that they had disbanded, progressive metal pioneers Queensryche are back. The band finished recording a new album on Feb. 23 with its new member, guitarist and producer Kelly Gray, who replaces Chris DeGarmo. The group has also signed a multiple-album deal with Atlantic Records, which will release the band's latest effort, Q2K, on Sept. 14. "This one's going back to our roots a little bit more," explains drummer Scott Rockenfield. "It's a hard record. It's more like Empire. It's not a conceptual record, it's not even a thematic record like Promised Land was, it's just a collection of 11 really cool songs. The last album had a certain vibe because Chris was doing a lot of what he wanted to do, and we let that happen...It was just time for him to go do his own thing really." Rockenfield adds that the band's parting with guitarist/ co-songwriter DeGarmo was amicable. 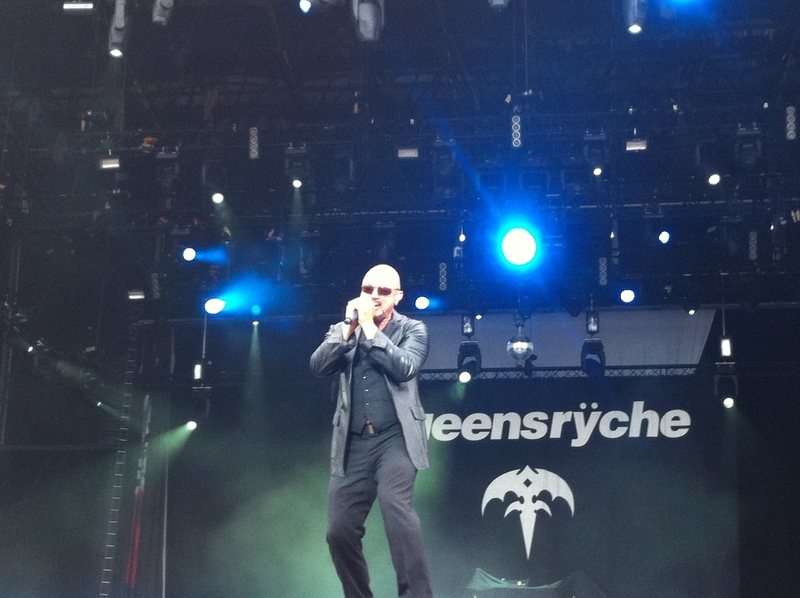 Queensryche is tentatively planning to begin its next tour of the States in early October. The quintet plan to play 3,000- to 6,000-seat venues. In other recent changes, the band has a new manager, Ray Danniels, who also handles Rush and Van Halen. 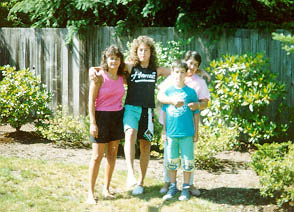 Danniels directed the band towards Atlantic when it was shopping around Q2K. 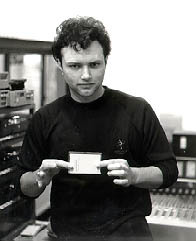 As far as its new musical member, Gray is known for his producing and engineering skills, and he was also one of Rockenfield's high school buddies. "He used to be in a band with [singer] Geoff [Tate] and a couple of the other guys in the band prior to Queensryche forming," the drummer says. 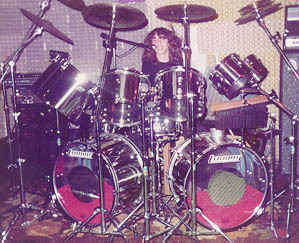 The band, called Myth, was active circa 1980 and 1981. "We actually took Geoff out of Myth to join us," Rockenfield recalls. "[Now] 20 years later, Kelly's back in the band. It's funny how the world revolves. The relationship has been really exciting. He fits right into place with what we've been as a band but also has a lot to offer us [in terms of] a new perspective." 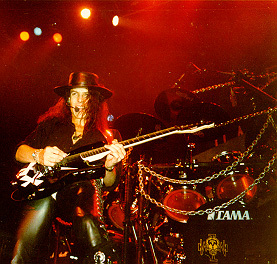 In other Queensryche-related news, the second release by Rockenfield's side-project with Paul Speer, titled Hell's Canyon, should be released soon. 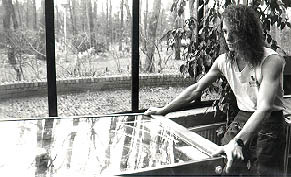 Rockenfield describes the project as "progressive metal ambient rock." Rockenfield and Speer's first collaboration, Televoid (both a CD and full-length computer-animated video released through Miramar last year), was nominated for a Grammy Award for best long-form music video. 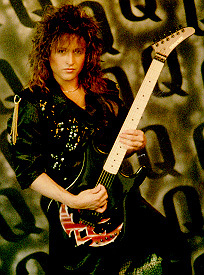 Guitarist Kelly Gray has left the Seattle-based progressive metal act Queensryche. 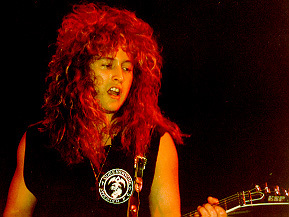 The artist joined the band in 1998, replacing co-founder Chris DeGarmo. 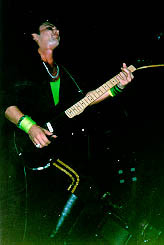 He appeared on the band's 1999 Atlantic album "Q2K" and last year's "Live Evolution" collection. 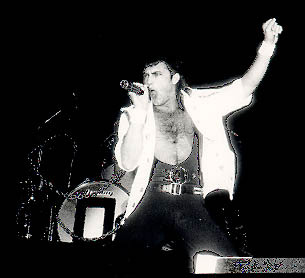 In the early '80s, Gray played in the band Myth with Queensryche vocalist Geoff Tate. 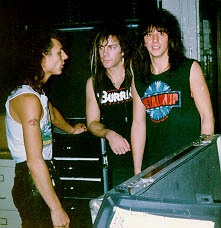 According to Tate, Gray came into the band with the understanding that he was not a permanent member, and that he actually departed last November. "Working with Kelly was really fun at the time," Tate tells Billboard.com. "I think we sort of came to a place where having him stay in the band would kind of limit him and limit us, so we decided to part ways and do different things." Queensryche has not hired a steady replacement and most likely will not do so, opting instead to collaborate with different songwriters when the need arises instead. "We've decided to work with outside writers and different people that we admire," he says, noting that remaining Queensryche guitarist Michael Wilton will play all the guitar parts and will be joined by other "guest players." It has been strongly rumored that DeGarmo is recording with Queensryche for its next studio album. Tate says this is not true, but when asked if there were plans for DeGarmo to work with his old bandmates in the future, he replies, "I don't want to say 'yes' and I don't want to say 'no,' because [Chris] might call up one day and say, 'Hey, I've got some songs and I'm really interested in recording with you guys. You wanna do it?' and then I'd have to eat my words. So I'll say there are no plans at the moment, but the door is open." Tate reveals that about half of Queensryche's next studio album has been written; he hopes those duties will be completed before he goes on the road this summer to support his self-titled Sanctuary solo debut . Wilton is working on material with his side band Soulbender, and drummer Scott Rockenfeld recently released an album with the group Slave To The System, whose lineup includes Gray.